uuid : 46333ac1-b046-424a-bebb-c25d3feb6c9c templates_id: 119464 templates_uuid: "0234877f-f871-43db-ae06-36bf067aadb5" title: "Terms and Conditions of Sale of Goods to Consumers - B2C" display_name: "Terms and conditions for sale of goods to consumers" meta_keywords: "T&C\'s for the sale of goods B2C" description: "
Protect your business with clear and fair standard terms and conditions of sale of goods to consumers (except online). Use these business-to-consumer (B2C) terms and conditions for any business in England & Wales that sells goods to consumers other than online, eg, in a shop, or as part of a home business. They are designed to be straightforward and comprehensive so that customers know where they stand and needless disputes can be avoided. They cover key issues such as orders, delivery, pricing, payment, guarantees, cancellation, liability and data protection. You do not need to use these terms and conditions if you offer goods on a daily basis which are sold immediately when the contract is entered into (eg groceries or newspapers). What are terms and conditions for sale of goods to consumers? Terms and conditions for the sale of goods to consumers (also known as T&Cs) should be used if you want to supply goods to a consumer on standard terms. They should cover key issues such as orders, delivery, pricing, payment, guarantees, liabilities, cancellation and termination. Why do I need terms and conditions for the sale of goods to consumers? Terms and conditions for the sale of goods to consumers protect your business interests, ensure that customers know where they stand and help avoid disputes. You can state in the T&Cs the time period for which payment is required for the goods. However the time period between payment and delivery of the goods can\302\222t be too far apart (eg 1 year in advance of the delivery).
" created_timestamp: "2018-10-08 04:36:08.0" modified_timestamp: "2018-10-08 04:36:08.0" active: true created_by: 236 modified_by: 236 dcm_id: 327 url_slug: "Terms-and-conditions-for-sale-of-goods-to-consumers" meta_description: "Create terms and conditions of sale of goods to consumers (except online) with help from Rocket Lawyer. Protect your business with straightforward and comprehensive terms and conditions of sale of goods. Try this B2C terms and conditions template." role1: "Seller"
You can state in the T&Cs the time period for which payment is required for the goods. However the time period between payment and delivery of the goods cant be too far apart (eg 1 year in advance of the delivery). More than just a Terms and conditions for sale of goods to consumers template, our step-by-step interview and guidance makes it easy to create your document. Easily create online, download, print and sign your free Terms and conditions for sale of goods to consumers in minutes. 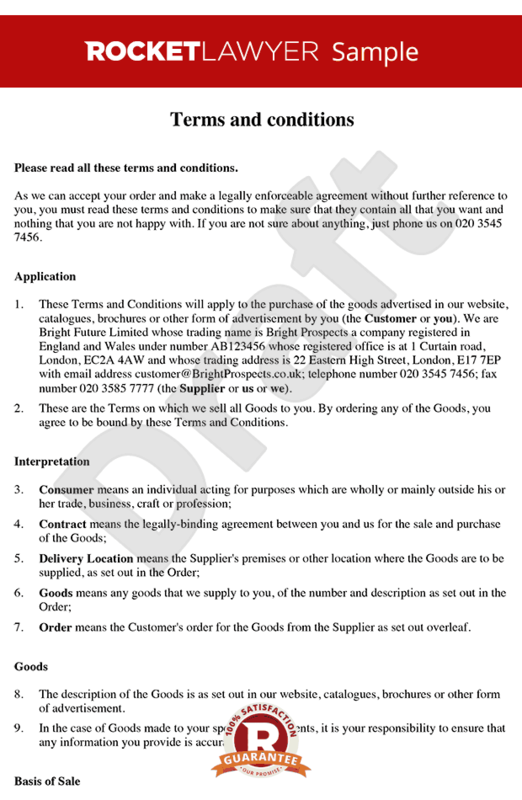 This document is also sometimes called: T&C's for the sale of goods B2C.